The most visited e-commerce platform in the region, Lazada is set to integrate Singaporean online grocer RedMart – acquired by Lazada in 2016 – next month, meaning that shoppers will now be able to buy groceries and fresh produce along with Lazada's other product categories on one single platform. With more consumers choosing to get their groceries online, Lazada’s acquisition of RedMart will help boost Lazada's grocery and supermarket offerings to more than 165,000 products – the largest assortment yet offered by any grocer in Singapore. "RedMart's move onto Lazada is just the first step in our ongoing journey to be a game changer in the online grocery market, and become the region's most trusted supermarket and ecommerce platform as customers increasingly shop online," said RedMart co-founder Roger Egan. Apart from Singapore, Lazada is looking to launch its grocery and supermarket business in at least one other city in the second half of 2019. Apart from their huge inventories, online retailers are able to sell their products cheaper as they do not have to incur the same operational costs as brick and mortar establishments. 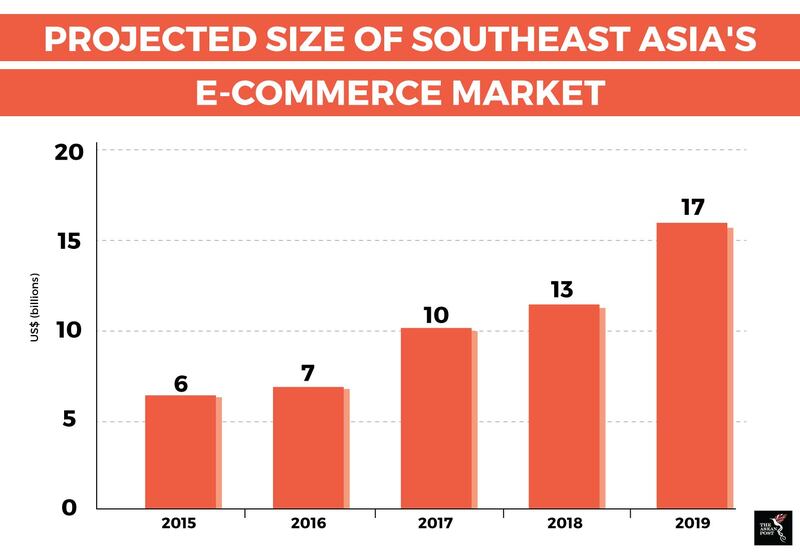 With mobile and internet penetration rates among the highest in the world and a rising middle class, e-commerce companies such as Lazada and Shopee are set to become the preferred destinations when buying groceries. Increased competition amongst industry players has also seen several notable department stores and retail outlets shutting shop in the region. In Singapore, department store Hypermarket Giant closed two outlets last year while another is expected to wind down operations in the first quarter of 2019. In Malaysia, another department store chain, Parkson, announced it was closing its three-level, 126,000 square foot Suria KLCC outlet after two decades. Last year, the company closed a 220,000 square foot outlet in a busy downtown Kuala Lumpur mall where it was the anchor tenant since 2014. In Indonesia, shoe manufacturers Clarks and Kickers closed last year citing dwindling profits amidst pressure from online retailers and high import duties – although it was later reported Clarks would reopen three of their 25 branches. Indonesians can still buy Kickers online through e-commerce platforms such as Lazada and Shopee. Physical stores will have to adapt and do more to embrace technology in their operations by incorporating Fourth Industrial Revolution tools such as big data, Artificial Intelligence (AI) and blockchain to analyse their customers’ spending patterns, enhance their shopping experiences and create more secure payment options. Increasingly, traditional retail stores are realising the need to go online to counter e-commerce platforms and complement their brick and mortar services. As opposed to just being a means to showcase their products, brick and mortar stores can evolve to become delivery or collection hubs and produce meal kit services – offering consumers pre-measured fresh ingredients and recipes delivered to their homes to make it easier for them to cook – as another value-added service. Despite news of physical stores closing down, online retailers themselves are opening physical stores to monitor feedback on products – proof that brick and mortar is not going to become obsolete. A study by Google and Singapore’s Temasek Holdings found that 3.8 million new users come online each month in Southeast Asia, making it the fastest growing internet market in the world between 2015 and 2020. Combined with a grocery market which is expected to be worth US$309 billion by 2021 according to Lazada, physical stores will have to change with the times to remain relevant in 2019 and beyond.